We are planning a packed week of Windsor Chair making and traditional Windsor Chair construction technique this October! Peter Galbert will be on hand for a week-long hands-on class in building a Child’s Windsor Balloon Back Chair. 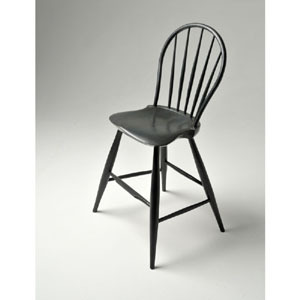 This handsome Windsor design has a graceful curved bow back and crisply shaped, shield-style seat. Generous leg splay gives this chair stability, while ample leg rake provides the chair with a sophisticated, elegant profile. The 21″ high seat improves the reach for younger folks at a dining table or desk, yet this chair can accommodate adults comfortably and would be a beautiful heirloom accent piece in your master bedroom, foyer, office or studio. Peter has taught at select woodworking schools around the country and teaches at his workshop in Jefferson, NY, where he builds chairs full time. His work integrates the best of time-honored techniques and demonstrates a deep understanding of materials and methods. He combines the structural integrity of time tested design & materials with his personal aesthetics aimed to please the eye and the body; all of which combined with his superb craftsmanship, make for chairs that delight the eye, cradle the body, and last for generations. Peter’s passion for teaching, inventing, and sharing his insights about the life of a chairmaker can be sampled on his Website and his Chair Notes Blog. In addition to constructing the balloon back chair, Peter’s goal is to provide the students with skills that will help them to continue to build chairs at home. While this class is perfect for those new to Windsor chair building, its also suitable for those who’ve made a Windsor and would like to add a new & distinct design to their repertoire. So get ready to work hard, have fun and learn a whole new way of woodworking! Recommendation Engine Just starting out in Woodworking? Me too!